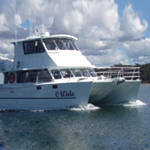 We are situated two hours north of Brisbane and two hours south of Bundaberg at the Tin Can Bay Marina, Emperor Street, Tin Can Bay. Fishing offshore, heritage listed, Fraser Island. 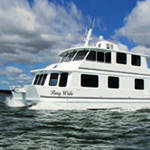 Or a leisurely cruise along the Great Sandy Strait. All meals, Coffee/Tea/Soft drink, fishing tackle and bait supplied. Tin Can Bay Marina Fuel Pontoon.